The Care Plus® Emergency Blanket protects against cold and heat. 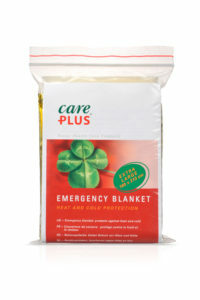 It can be used in the event of accidents, fire, and heavy weather. When the silver side is facing inward, the aluminium reflects back around 80% of the body temperature, preventing hypothermia and freezing. When the silver side is facing outside, the blanket acts as a sunshield, keeping the body, car, or tent cool. For use in the event of accidents, fire, and heavy weather. Gold on the outside: provides protection against cold. Silver on the outside: provides protection against heat.